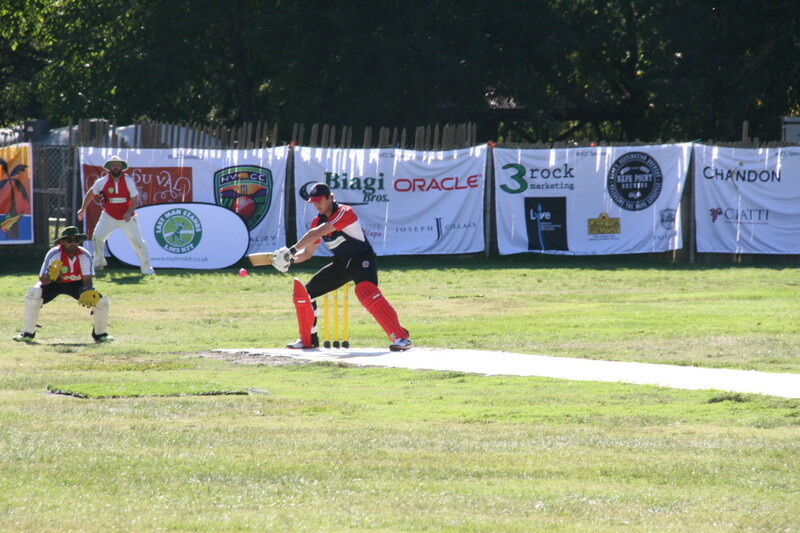 Last Man Stands, a new, fast-paced and shorter version of cricket, touched down in the USA at Napa Valley Cricket Club’s home ground, the Fairgrounds in Calistoga. 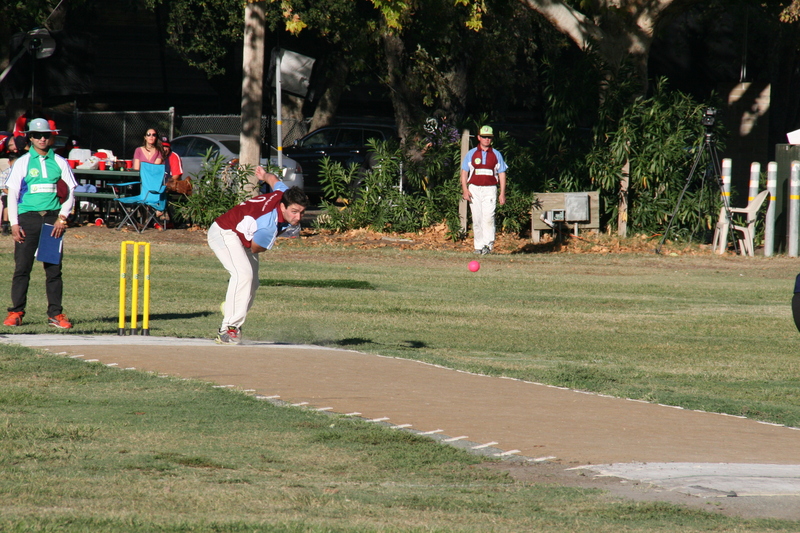 The two-day tournament was co-hosted by Napa Valley and Marin Cricket Clubs with NVCC hosting day one. 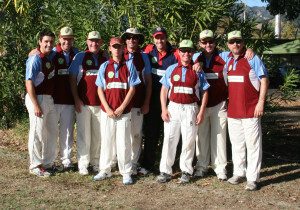 The Sonoma Gullies and Compton CC joined the hosts in the four-way tournament. Apart from the cricket the highlight of the weekend was undoubtedly playing and hosting the storied Compton CC from Los Angeles, with their guest captain English test and Somerset County player and namesake Nick Compton, who flew in from London for the tournament. The Compton CC, known as the “Homies and the Popz” was formed in 1996 specifically to give young men in the troubled Compton area of Los Angeles an alternative to gangs and violence and a more promising future than prisons. Since their formation they have toured both domestically and internationally and it was great to be able to show them some Napa Valley hospitality. Nick Compton joined the Compton CC team for the weekend providing both his abilities and insights to the team. Off the field he provided encouragement to younger members of all the clubs participating and was happy to share stories on life as an international player with anyone who had a question. On the field he dominated at the crease and by the end of the weekend he had amassed 232 runs for just the one dismissal at a strike rate of 241. In the first match NVCC got off to a great against Sonoma Gullies, with openers Kiranpreet Singh and Phil Bourke putting on almost 100 in under 12 overs before Singh was compulsorily retired at 50. 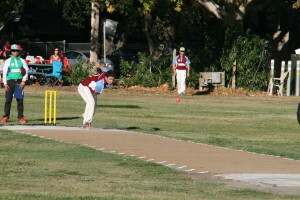 After Bourke was dismissed shortly after the Napa batting struggled and they finished at 6 for 147 off their 20 overs. In the field NVCC again started well keeping Sonoma’s scoring in control early along with a few wickets. However once Sushil Kumar came to the crease for the Gullies the tide turned; Kumar took to the Napa bowling like a chain saw to candy cane and raced to 55 in just 16 balls before having to retire. 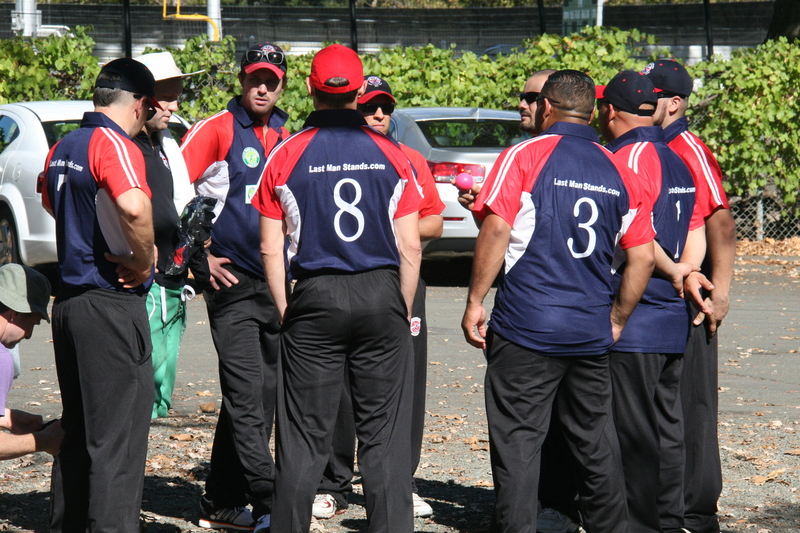 The damage was done though and Sonoma ended up reaching NVCC’s scored with a couple of overs to spare. NVCC’s second match was against Compton CC and again performed admirably with Nick Compton proving to be the difference, scoring 55 in 26 balls to help his team get to 143 in a reduced 16 over match. Tim Irwin and Bernie Peacock were the pick of the Napa bowlers both producing tight spells with economy rates of 3.33 and 3.67 respectively while Peacock also picked up two wickets. In reply NVCC again started well but the middle order and tail, playing in fading light, fell away falling just short by 15 runs. Martin Mackenzie was the standout batsman with 84 not out off 36 balls after retiring at 50 and then coming back in at the end of the innings. At the end of the first day’s play in the Napa Valley, club president Phil Bourke presented Nick Compton with a bottle of Napa Valley wine from title sponsor Clos du Val along with a Napa Valley club shirt. Clos du Val wines were also presented to the Compton Cricket Club and to Wayne Greve, CEO of Last Man Stands, who also flew in from London for the tournament. The second day of cricket moved to Piper Park in Larkspur and NVCC took on Marin CC in the final game of the round robin format. Marin scored quickly in another reduced over match, getting 156 off their 18 overs, with Kiranpreet Singh NVCC’s most economical bowler with an economy rate of 3.75 and one wicket. While NVCC was out of contention for the final the game’s outcome would still influence who would participate however NVCC’s batting fell apart in spectacular fashion. Marin’s two opening bowlers managed to smash through NVCC’s batsmen dismissing them in seven overs for just 25 runs. The final was between Sonoma Gullies and Compton CC with Sonoma coming out on top to win the tournament. After the series the Last Man Stands organization selected a Dream Team based on performances over the weekend. Nick Compton headed up the Dream Team as clearly the best player of the weekend and was joined by Phil Bourke from NVCC as wicket keeper/batsman and two players each from Sonoma Gullies, Marin CC and Compton CC. While NVCC did not have any success on the field the players learnt a lot about the idiosyncrasies of this new and exciting form of cricket and look forward to playing with more success in the upcoming North Bay Series. Sunday 2nd November at the Fairgrounds Calistoga. 9:00am against the San Francisco Seals and again at 1:45pm against Marin Socials both games are part of the Last Man Stands North Bay Division. Sponsors – The Napa Valley Cricket Club wishes to acknowledge the assistance of the following sponsors – Clos du Val, Cork Supply USA, Tonnellerie Saint Martin, Biagi Bros., Oracle, go vino, 3 rock marketing, Domain Chandon, Napa Point Brewing, Joseph Cellars, Cornerstone Cellars, Ciatti & Co., Rebel Dog Hot Dogs, Napa Gourmet Foods, Treasury Wine Estates, Lyve Systems Inc., Calistoga Roastery, IPC Hospitalist Group, Taltarni, 707 Embroidery Zone and TricorBraun WinePak. The Napa Valley Cricket Club will host the opening day of the Last Man Stands USA launch weekend this coming Saturday 18th October at the Fairgrounds in Calistoga. 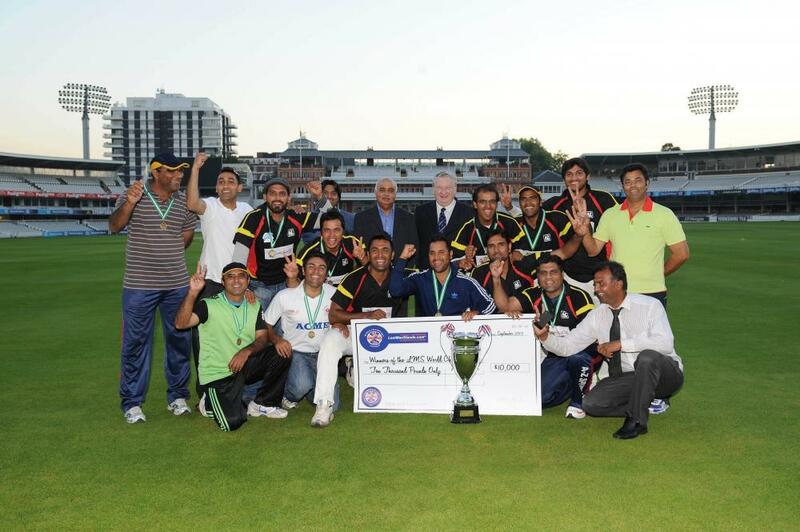 Last Man Stands is the widest reaching amateur cricket league in the world with over 2000 teams playing the format globally. 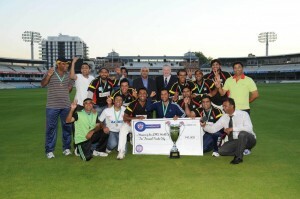 The format is T20 (Twenty20), 8-a-side and games last around 2 hours. LMS is played by the normal laws of cricket but with a few extra rules to make the game more inclusive, exciting and quicker! The LMS launch weekend will consist of two-days play between four teams at both the Fairgrounds in Calistoga and Piper Park in Larkspur. In addition to the Napa Valley and Marin teams taking part there will be an “all-star” team from the South Bay and Compton Cricket Club who will be travelling from Los Angeles. To add a further draw to the weekend England international cricketer, Nick Compton, who will be flying in from England for the weekend, will captain Compton CC. There will be four games of cricket at the Fairgrounds on Saturday starting at 9:00am as Napa Valley CC play the South Bay all-star team of “Raj’s Rasta Rebels” with further games at 11:15am, 1:30pm and 3:45pm when Napa Valley plays Compton. On Sunday the weekend’s game move to Piper Park in Larkspur, the home of Marin Cricket Club, with the first game there at 9:30am. You can see the full schedule here. After this weekend’s games are complete the Last Man Stands North American Championship will launch the following weekend and will feature four separate Californian Divisions. In addition to a North Bay Division featuring Napa Valley CC there will be a Silicon Valley, Central Valley and Los Angeles Division. After a series of games through October and November there will ultimately be one champion from these four divisions that will represent the USA at the 2015 Last Man Stands World Championships in Barbados next spring. Admission to games this Saturday at the Fairgrounds in Calistoga is free and spectators are welcomed and asked to bring a chair, a cooler and a sense of adventure!